Former U.S. 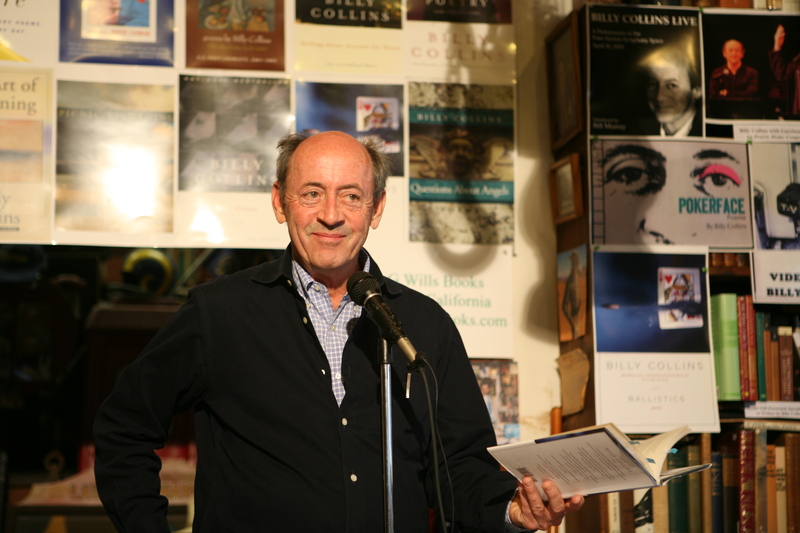 Poet Laureate Billy Collins,in a recent chat with a Wall Street Journal reporter, talked about "banging his head" against the likes of Joyce, Pound and their attendant difficulties and his eventual decision to align himself with poets like Philip Larkin and Robert Frost and "poets, who dare to be clear." Superb models to use if you're aspiring to write in contiguous sentences unmarred by needless line breaks. Poetry readers should be grateful that Collins found his voice in the place where the conversations are actually happening, in the world and not the rheumy chambers of a book-addled soul. Difficult poetry that is actually good is difficult to write, and there are only a few among the millions who do so who actually deserve attention,praise, and continued discussion. At this stage,it becomes increasingly the case that there are far too many poets in the world who are trying to out- perform Stevens, Eliot, Stein, Olson in pushing the limits of poetry; the last group I paid attention to who managed difficulty that intrigued, provoked and which stopped making sense in a variety of works that made younger poets like myself examine the tropes I was using and attempt, with some success, to put it back together again, perception and images in newer works that come out just a little more out of the long shadow of previous and still present genius. So thank you LeRoi Jones, Ron Silliman, Rae Armantrout, Paul Dresman, Bob Dylan and a few dozen others read in fifty years of reading for helping me , no, forcing me beyond my self-entombing idea of genius and moving me closer to the public square. No longer a younger poet stumbling in his attempts to master what seemed to be fashion at hand, I'm old enough to accept the less stringent view that the only criteria for judging a poem's style, format, complexity and other such matters is in how well it works on the reader who is reading it? Difficult or clear as glass, does the poem make a music one wants to understand? Billy Collins, of course, has his own amazingly effective style of clear poetry, and it's a marvel to read how he begins with a scene,a situation performing what is often a banal house- hold task--listening to jazz, paying bills, a drive in the country, a bit of coffee in the city--and then a reverie of a sort,a memory triggered by some inane object , a recollection often seasoned with a light application of Literary Reference, just enough to expand the notion or expose a contradiction in his own assumption (the insight often being a dead sage's warning or mere reflection about matters of pride and exaggerated expectations)And then there's a seamless transition to the scene from where he began his writing, the material world unchanged but, for the rumination that we've just read, is not the same as it was.His genius and flaw are the same heightened talent, his ability to produce these compact missives of everyday wonderment continuously.That's not to denigrate his skill at writing them, as the economy of his language, the resourcefulness of his imagination to find new twists and inlets within the limits of his style, and the genuinely resonating effect of his phrase-making mark a writer who works his pieces; he is a professional, aware of his audience, aware of his materials, an artist who refuses to let any of his ideas get muddied by the pretense of deeper intimations.William Carlos Williams had the view that the thing itself is its own adequate symbol. Whatever one seeks to describe in the world one sees is already complex . Collins, more so than Williams, explores connections , fleeting though they are , of the things around to the world his imagination creates a frame for when he departs from home. His strategies, of course, are more varied than what I've described, but this is a recipe he uses as often as not, a template he can expand, revise, contract at will, a habit he does splendidly. This makes him a good artist, a good craftsman, but it is also something that makes me want to call him a writer rather a poet. He is , I think, the equivalent of the old school local newspaper columnist who would, twice or thrice a week, write 700 words or so about something in the news, in his life, whatever comes to mind, who would end his reflection that effectively left the reader reassured and just a little confused as to the purpose of that day's topic. The secret, though, was less to give meaning to the community one recognizes, but rather create the sense of texture. Columnist and poet Collins have skills that remind of things that you cannot quite put a finger on--something is lost, something is joyful, something is sad or funny, but how, why , what is it? I might mention as well that Collins' work seems to be a sequence of experiences that are uninterrupted by work situations.Others can, I imagine, provide me with poems of his where work is an element, a strong one, perhaps even the subject of the poem, but it occurs to me that Collins , at least in many of his poems, is a flaneur, a walker in the city, a watcher, the character who observes, records, relates the isolated bits of daily experience, testing the limits of his ideas, constantly re-acquainting himself with his own fallibility. Please don't mistake that for a bad thing. It's nice work if you can get it.